Funnily enough, it was just about 13 years ago. When the Dodgers signed 29-year-old speedy singles hitter Juan Pierre to a five-year, $44 million contract in November 2006, I was upset. Pierre couldn’t have been a nicer human being, and down the road, in the wake of Manny Ramirez’s 2009 suspension, he became a redeemed folk hero not entirely unlike Juan Uribe. From the day Pierre signed, however, the contract seemed like a waste of Dodger payroll at a time that Dodger payroll was precious. Given that he didn’t walk, throw, hit for power or succeed on enough on his stolen-base attempts, Pierre did not bring the Dodgers closer to ending their two-decade World Series drought. Over time, especially since the end of the McCourt era, less and less has angered me since. I’ve changed, and the Dodgers have changed. This front office’s thinking aligns much better with mine, plus there is more money to spend. I also have realized that most things in baseball just aren’t worth getting that riled up about. So when the news came Thursday that the Dodgers’ final interest in Bryce Harper had fallen short of a deal, I was pretty deeply disappointed, but I wasn’t angry. I’m willing to see what happens. It puts much more pressure on players like A.J. Pollock, Joc Pederson and Alex Verdugo, but I’m hopeful. I’m curious. Still, though signing Harper might have turned badly for the Dodgers, I believe it was worth the risk. Let’s address three common misconceptions about Harper and long-term contracts. If the Dodgers’ victory today clawed every bit of energy out of the fans, it nearly did the same out of Clayton Kershaw. So, you’re about to hit publish on a story that says the Dodgers’ eighth-inning magic has disappeared. And then, at the last moment, you look up — and in comes the magic, nearly past deadline but better late than never for Los Angeles. With the Dodgers trailing by a run and two outs remaining, pinch-hitter Howie Kendrick reached first on a single. Yasiel Puig came up and lined a single to left field that — absolutely stunningly — went past Washington center fielder Michael Taylor, for a two-run Little League home run that gave the Dodgers a 4-3 victory over the Nationals. Technically, it was a single plus a three-base error — plus that irresistible dash of Puig — that extended the Dodgers’ winning streak to six games. It’s the fourth time the Dodgers have come from behind in the eighth inning or later during the streak. And it was the fourth completely bizarre play to take place at Dodger Stadium tonight. Washington had taken the lead an inning earlier — but first, some context. In the top of the eighth Tuesday, in pursuit of the Nationals’ third run of the game, catcher Wilson Ramos was thrown out at home by the Dodger left fielder. In the top of the eighth inning tonight, in pursuit of the Nationals’ third run of the game, Ramos made it much easier on himself, launching a 421-foot homer over the Dodger left fielder and taking his time to circle the bases. 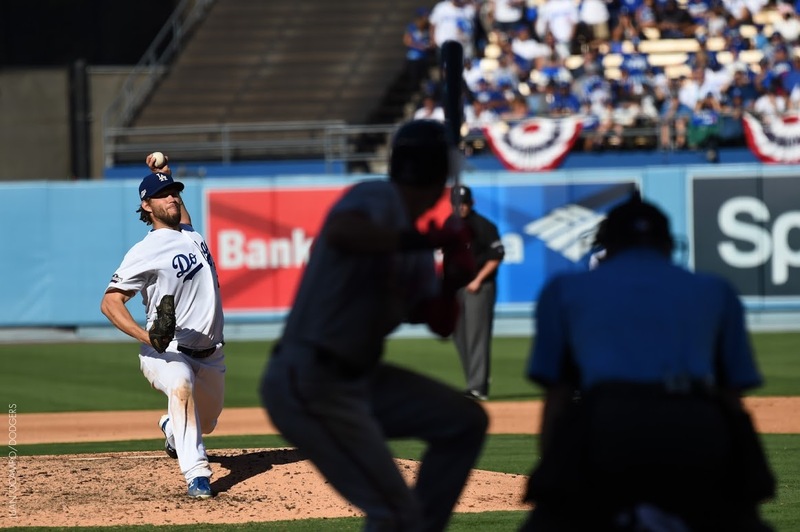 That shot broke a 2-2 tie that had lingered since the third inning and put the Dodgers in jeopardy, until Kendrick and Puig turned things around with the help of Taylor, whose night was a complete nightmare. In the top of the ninth, Taylor became the sixth player ever to earn a platinum sombrero against the Dodgers by striking out five times in a game. Dodgers at Nationals, 10:35 a.m.
Hopefully, Zack Greinke’s Florida roots will come in handy today, because this is gonna be a steamy one. 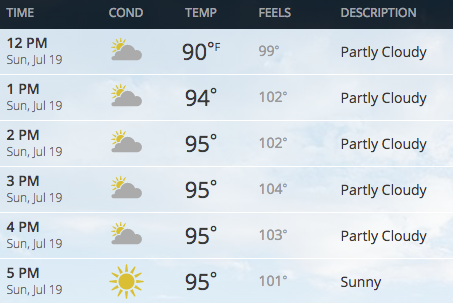 Greinke has thrown 35 2/3 consecutive scoreless innings and retired 36 of his past 37 batters, but those numbers will be challenged not only by Bryce Harper and the Washington Nationals, but also by the triple digit heat index in Washington D.C. during today’s game. 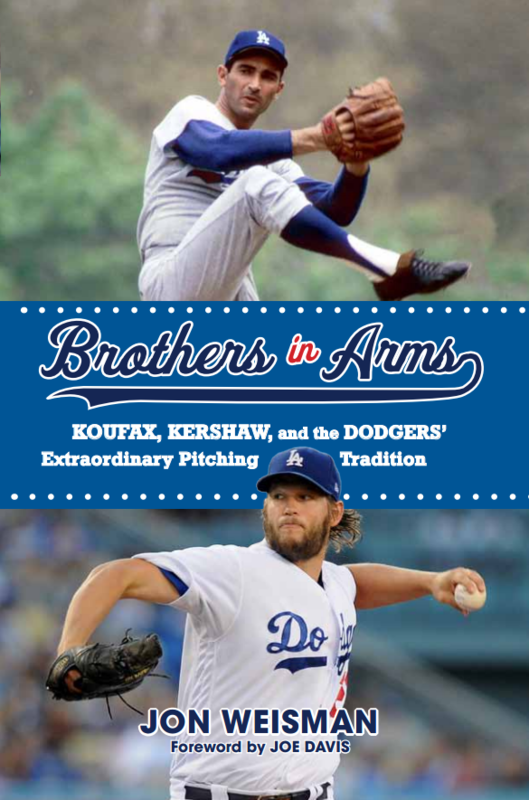 Facing fellow All-Star righty Max Scherzer in today’s primo pitching matchup, Greinke would need six scoreless innings to move pass Clayton Kershaw for third place on the Los Angeles Dodgers all-time streak list, behind (as if I need to tell you) Orel Hershiser and Don Drysdale. Carl Crawford will rejoin the Dodgers in Atlanta on Monday, with his activation from the disabled list imminent. Don Mattingly told reporters today that figuring out how to create a roster spot for Crawford is not an easy decision. Counting Alex Guerrero and Kiké Hernandez, Crawford’s return would give Los Angeles a surplus of seven outfielders, pending the next roster move. Alberto Callaspo could be vulnerable, though he is the team’s only infielder off the bench that can bat from the left side. Brandon Beachy’s second start after his second Tommy John surgery will take place Monday at his first MLB home, Atlanta — but Beachy is trying not to think about that, he told J.P. Hoornstra of the Daily News.